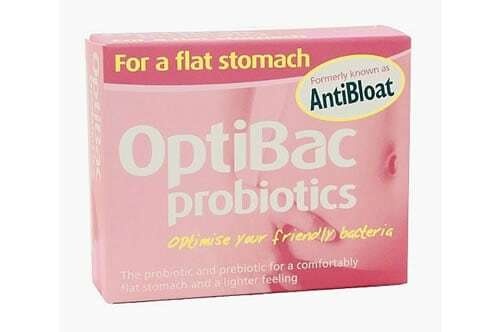 PRODUCT REVIEW: Optibac Probiotics 'For a Flat Stomach'. - IBS & Intolerance Help! PRODUCT REVIEW: Optibac Probiotics ‘For a Flat Stomach’. – IBS & Intolerance Help! Today I thought I would talk to you about a product I have recently tried out that isn’t food based but is for the stomach! The product in question comes from the brand Optibac. Optibac specialise entirely in probiotics which are natural and claim to have beneficial effects on the body. They do a fairly large range of different probiotic products which all contain slightly different strains, which thus have slightly different effects on the body. One of the probiotics that Optibac offer is called ‘For a Flat Stomach’. Anything that claims to aid a flat stomach I am more than willing to give a try, as I find my IBS and gluten intolerance balloon my stomach beyond an acceptable level for most days of the year! I am sure many of you can relate to this as well unfortunately. Basically, ‘For a Flat Stomach’ is a seven day programme. It comes as a powder in seven separate sachets that you take daily dissolved in water with your breakfast. The effect of the one week course is then supposed to last up to three weeks and aids in naturally re-balancing ones digestive system. I would waffle on and go into the details of this further, but I think the Optibac website does the product a lot more justice in terms of an explanation than I could, so I highly recommend you checking the page out. What the website explains, for me, makes everything much clearer with regard to what is going on inside my stomach. I’d say that just this website alone tells me a lot more than any GP has ever told me; but then I guess that isn’t difficult when I have found GPs incredibly unhelpful with all my stomach issues. So instead of explaining the ins and outs of the science behind our lousy stomachs and the formula of probiotics, I thought it would be better if I just gave you the low down of how I got on with it personally! The first thing I really liked about the product is that it is completely tasteless! After dissolving it in water you can’t taste a thing which is always a pleasant surprise. I also just liked the fact you take it once a day with breakfast, it means that I never forgot to take it and equally always encouraged me to have a good breakfast each morning to start the day! On the first two days of trying the product I actually did find that my stomach became slightly more bloated than usual. However, I had already been told that this might be case seeing as my body was just getting use to the probiotics. I am so fed up with how my stomach is these days so I was more than willing to continue using the product in hope that things would settle, I am so glad that I did. There were a couple of occasions later on in the week that I found myself over indulging on food and eating a lot more than my body is capable of digesting. This usually results in an extreme amount of bloating and gas. However, somehow my stomach really didn’t hit the levels of bloating that it usually does… if anything I just found this incredibly strange at first! How on earth could I over indulge in such a way and not suffer?! I have to say I can’t put it down to anything other than Optibac… or a literal miracle! Of course I cannot yet say how long the effects are going to last as I’ve only just finished taking them but just the fact that I feel so good after a couple of days has made me think these are so worth it! I would highly recommend at least giving the product a try. If you are feeling a bit down about your stomach due to IBS or any intolerances that you might have (that causes a lot of bloating), I really would suggest giving this ago. If you’re like me, you’d do anything to just feel a teeny bit better each day! the range of Optibac Probiotic products! You can buy the product off the Optibac website, alongside a lot of other probiotics. For example they do one for ‘Maintaining Regularity’ and another one for ‘Bowel Calm’. I would think that for different IBS people these two might also be kind of handy to try out! ‘For a Flat Stomach’ is £8.69 which I don’t think is a bad price if it potentially could provide your stomach with lots of happiness! I also saw from their website that you can purchase it in various Waitrose stores and other health food shops; you can find your closest by clicking here. It would be really great to hear back from any of you that have tried Optibac in the past and how you got on with it or if you are thinking of using it in the future. I’m intrigued to see how it helps others too! Previous Post Mark’s IBS Diary – Episode Two: How To Manage Your IBS.